Detroit, Michigan, has a PR problem. Many, perhaps most, people around the country believe that Motown has become No Mo’ Town, a blighted urban landscape, slowly decaying, with entire deserted neighborhoods given over to so-called “urban prairie” and the crumbling ruins of immense factories that once cranked out cars by the tens of millions. Maybe not quite postapocalyptic, but definitely postapoplectic. Put that notion in neutral. While it is true that a local company runs “The Fabulous Ruins of Detroit” tours, and that the 2010 U.S. Census showed 237,500 citizens departed the Motor City since 2000—the second greatest ten-year drop in population for any large city in U.S. history (only Katrina-devastated New Orleans lost more, 29 percent compared to Detroit’s loss of 25 percent)—the rumors of Detroit’s death are greatly exaggerated. The first Cadillac hit the streets of Detroit in 1701, although there weren’t actually any streets, just a small fort with half-a-hundred French Canadians led by their captain, Antoine de La Mothe Cadillac. By 1765, 800 souls lived beside the Detroit River, making it the largest city in French territory between Montreal and New Orleans. A century later, many Detroiters fought with distinction in the Civil War as members of the Michigan Wolverines, a heroic regiment led by George Armstrong Custer. “Thank God for Michigan!” Abraham Lincoln is said to have exclaimed after the Battle of Gettysburg. The city grew rapidly on an economy of shipping and manufacturing and then, in 1901, a thirty-eight-year-old local engineer and automobile designer named Henry Ford founded the Ford Motor Company. Twelve years later, he opened the assembly-line factory (his employees’ idea, many now believe) that would change Detroit, and the world, forever. One by one, mass-market automobile pioneers like William Durant, founder of General Motors, the Dodge brothers, Horace and John, and Walter Chrysler rose to success in Detroit. By the 1920s, the Motor City was king of the road. By the 1930s, growing labor unions including the United Auto Workers were in a sometimes pitched battle with the carmakers for a share of that enormous success. The expansion of the auto industry and the jobs it provided made Detroit the fourth-largest city in America in 1920, and by 1950 its population peaked at 1.8 million. And then, the very thing that made Detroit began to slowly shrink Detroit, as the car enabled more and more people to move to the clean, uncrowded suburbs. Urban Detroit began to empty. Soon, the auto industry began to shrink as well—consolidation began in the 1960s, reducing jobs, and the gas crises of the 1970s boosted market share for foreign automakers. By 2010, Detroit’s population had declined to 713,777 (smaller, for example, than Jacksonville, Florida), and Michigan became the only state in the nation to register a net population loss since 2000. The once thriving Motor City had shed several cylinders and much of its horsepower. News reports began with phrases like “The most startling example of modern urban collapse,” and the city became a cautionary tale—and a punch line: when comedian Kathleen Madigan was entertaining troops in Afghanistan, she was given a tour of schools, hospitals, and roads the soldiers had built. Such is the state of the city’s public image. And how long does this thought deter the optimism of Sandy Baruah? Even less time than it takes the new 560-horsepower Cadillac CTS to go through a gallon of premium. Baruah sees better things; he believes Detroit is already rising from the ashes. Assam is a state in the far northeast of India. Mostly separated from the rest of the country by Bangladesh, it is well known for its teas. This is where Baruah’s parents were born, coming to the United States in the 1950s, his father to attend medical school at Georgetown, his mother to attend Howard University. They settled in Washington, DC, where their only child was born in 1965. His father died when Baruah was just nine years old, and his mother moved with her son to Salem in 1975. Soon after arriving, Baruah’s mother opened a shop selling bulk spices, teas, and coffees, a sweet-smelling bit of Assam next to a Ford dealership. Growing up a dark-skinned Indian kid in oh-so-white Salem was never a problem for Baruah. The far bigger issue was that he had zero game. During high school, Baruah worked selling suits at the local Meier and Frank store, and life in the state capitol began to rub off on him. He became interested in politics, taking part in various civic activities and programs, some of which took him south to the UO campus. Early on, he found himself identifying with the Republican Party—as defined by a select list of Oregon examples. At the UO, Baruah split his studies between business, political science (the label on his degree), and economics, eventually winding up somewhere in between. He became more and more drawn to national politics, and in 1985 he took a two-year leave of absence from the UO to work for Senator Packwood on his campaign staff. It was his first look behind the curtain of big-time politics. Baruah returned to Eugene to finish up, and as he was preparing to leave the UO in 1988, he began to look for a job. He’d volunteered on the George H. W. Bush campaign, so he called up the Oregon campaign chair, Alan “Punch” Green, to ask for a reference. After Bush won, Baruah was asked to move to Washington, DC, to work in the new administration. This was the political equivalent of being called up to “The Show” in baseball, and the twenty-three-year-old Baruah relished the big-league atmosphere. Baruah was in wonk heaven, and he made the most of it, first as an assistant to the secretary of the interior, then in the Department of Labor. In the morning he might be writing policy papers or memos on appointees up for Senate confirmation, in the afternoon he might be getting coffee for a meeting—just as in The Show, even the hottest rookies carry the veterans’ bags. In 1993, like the president, Baruah found himself out of a job. He decided to return to Oregon, certain he would take the provinces by storm. He was wrong. And so, ten years after graduating from high school, Baruah found himself back in Salem, living in his mom’s house, once again selling suits at Meier and Frank and working on an MBA at Willamette University. He earned his MBA in 1995, about the same time his former boss’s son was taking office as governor of Texas, and went to work for a Portland-based corporate management consulting firm. He worked with clients that included Walt Disney World, Intel, and several banks. And when George W. Bush won the 2000 presidential election, Baruah was on his way back up to The Show. This time, people carried his luggage. 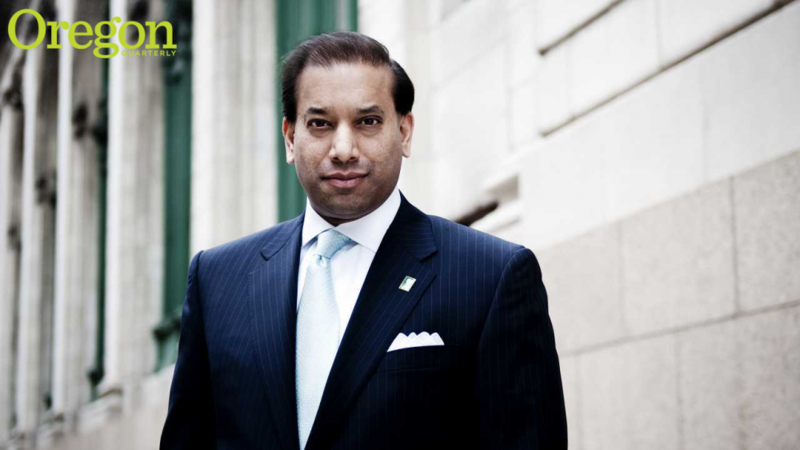 Baruah served as U.S. Assistant Secretary of Commerce, leading the federal government’s domestic economic development program. He took over as administrator of the U.S. Small Business Administration in the final year of the Bush presidency. And while the Republicans for whom he worked moved considerably farther right from Bush to Bush, Baruah insists he didn’t abandon his Packwood-Hatfield-McCall roots. “I didn’t change,” he says. “Certainly there are issues on which I disagreed with the second President Bush, a woman’s right to choose being one example, stem cell research being another—but the social issues are not why I was ever engaged in politics. And in most things I found Bush 43 to be an incredible humanist, constantly promoting the ideas of freedom and democracy and what they meant for human rights. Thanks to a geographical anomaly, from Baruah’s office high in downtown Detroit, he can look south into Canada—Windsor, Ontario, to be exact. It’s just one of many new perspectives that are informing his role as leader of the Detroit Chamber of Commerce. And if ever a chamber had a hard sell to make, Detroit has to be it. Chrysler and rapper Eminem took a gritty-but-proud approach to that media challenge with their 2011 Super Bowl commercial—the first positive bit of Detroit messaging in years—but, for Baruah, marketing isn’t the answer. “I’m just focused on fixing the fundamentals,” he says. “Here’s where we stand: The economy here has bottomed out and we’ve turned the corner. The bleeding has stopped. I think it’s stunning how quickly the auto industry, particularly the Ford Motor Company, has executed what I believe to be the most impressive industrial turnaround in history. From zero to hero in record time. And while we understand that everyone associates this city with the auto industry, everyone is working very hard to diversify this economy. We have tremendous assets—this is the engineering mecca of the planet, with the highest per capita population of engineers in the world. We also have amazing technology and financial resources here. And we have a whole new slate of leadership in the state, which is having a profound impact. A new city council, new mayor, and new governor are bringing new ideas. So how to turn it all around—or, if it has turned, to keep it going? Unlike several chambers of commerce around the country, the Detroit chamber hasn’t declared open war on labor unions as part of its probusiness stance. Baruah sees two very different inspirations for a new Detroit: Pittsburgh and Oregon. “In 1980,” he says, “Pittsburgh’s economy revolved almost completely around the steel industry. Today they have diversified, and steel is less than 30 percent of their economy, and the new steel industry is both more productive and more profitable. I think we’re already seeing that in the auto industry. Todd Schwartz ’75 is a Portland writer who believes in teaching people to fish—and giving them a couple fish while they’re learning so they don’t starve.